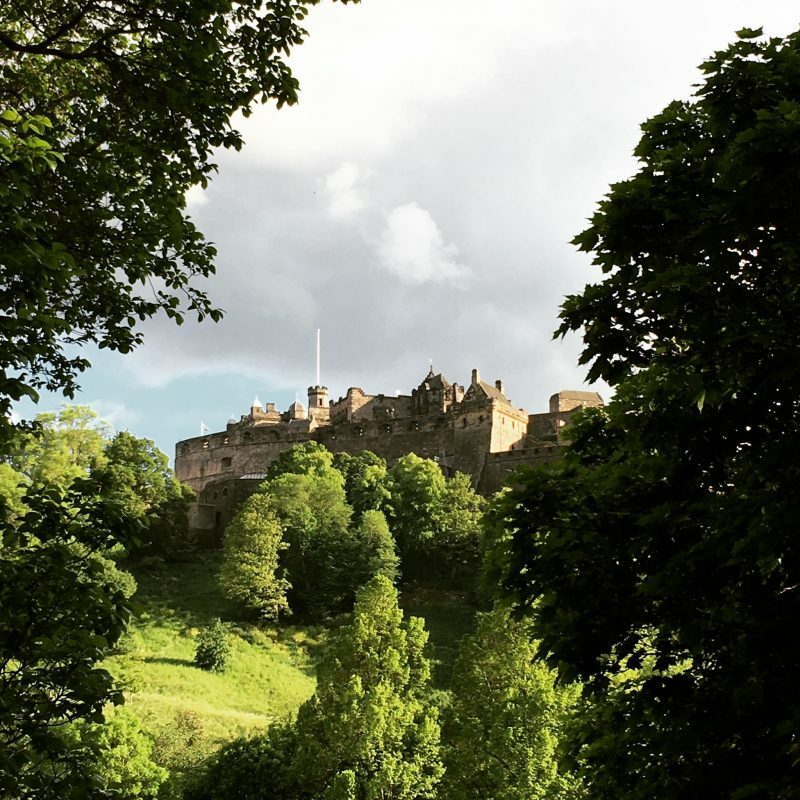 The city of Edinburgh is renowned for its festivals, culture, heritage and history. This niche guide takes you to a selection of places that align with The Travelling Bookbinder’s ideals and interests – paper supplies, books, a museum, libraries, craft shops – followed by a list of cake stops and eateries. It is one particular slice out of many you could choose. Enjoy! 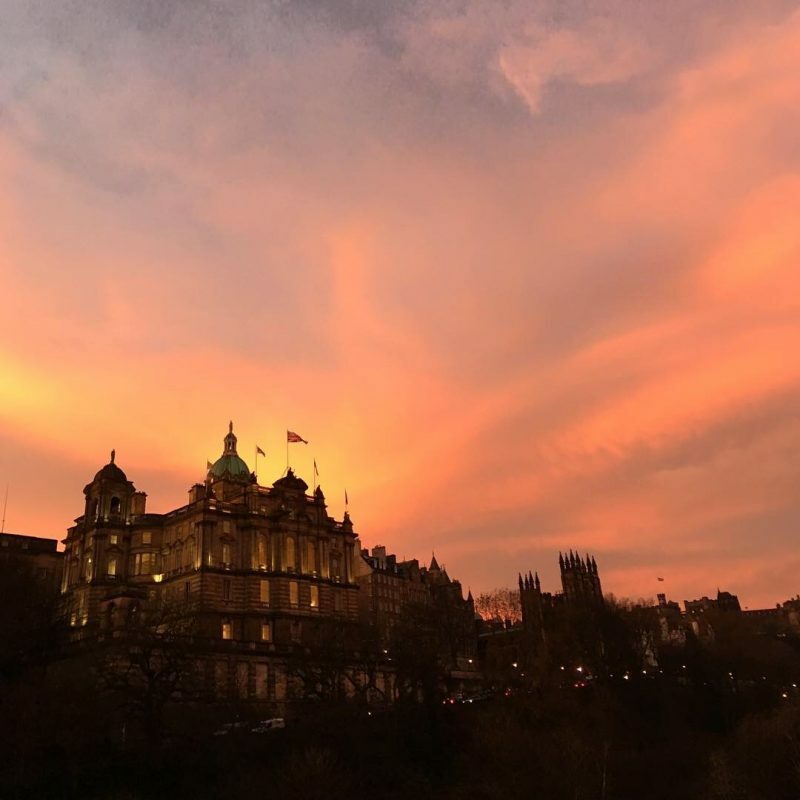 Welcome to a city straddling a medieval Royal Mile, the 18th century New Town and a contemporary capital. Discover cobbled streets, and magnificent architecture as you walk between locations. If limited by time or mobility, hail a black cab or invest in a day bus pass from LRT. Be sure to call ahead or check websites for opening times. 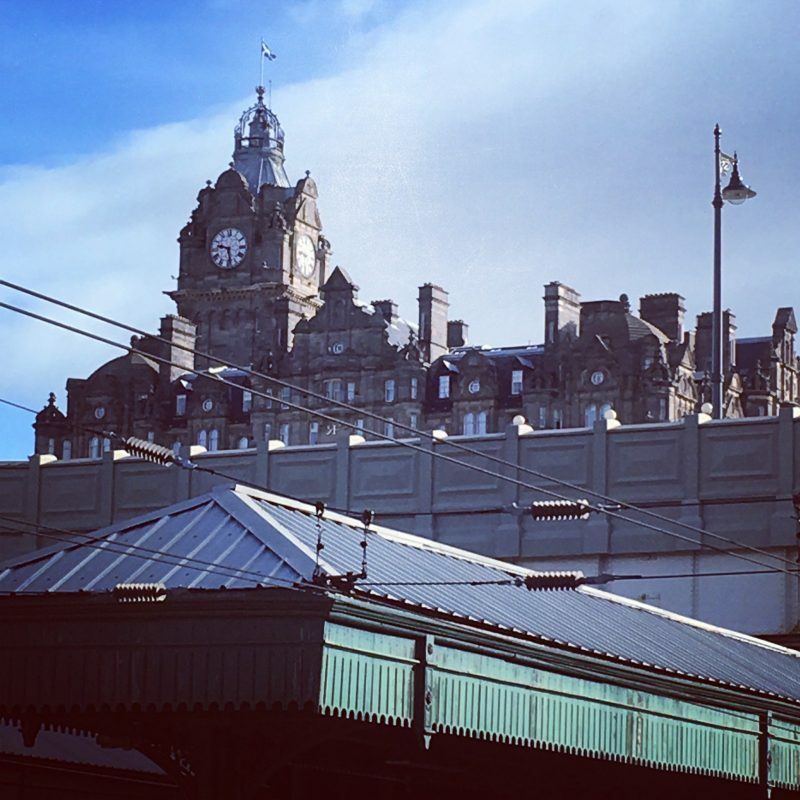 Literary love: Edinburgh has the only railway station named after a novel. It is also the first UNESCO City of Literature. Edinburgh Art Shop 129 Lauriston Place. General art supplies, including washi tape, Posca pens, glassine paper amongst lots more. Serves the nearby art college with enthusiasm. Greyfriars Art Shop Greyfriars and Dundas Street. 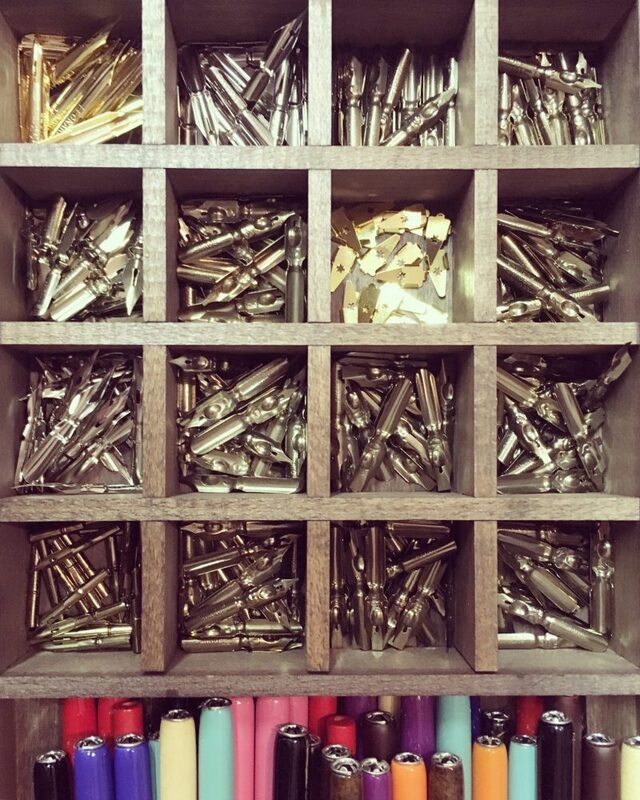 Fine art materials. Knowledgeable and friendly staff advise on paper selection, sold in pads and by the sheet. Stockist of Automatic Pens, as featured in the PaperLove and BookLove e-courses. Henderson’s Art Shop 28A Raeburn Place. Art supplies and framing service. 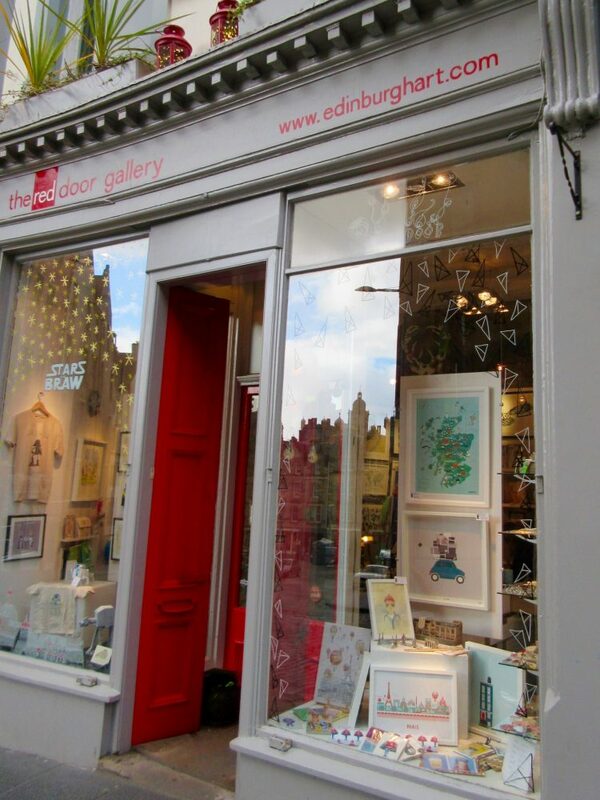 Established for over forty-five years, Stockbridge’s go-to place for paints, paper, brushes…. and calligraphy nibs on the counter. Paper Tiger 53 Lothian Road and 6A/8 Stafford Street. Stationery emporium with cards for any occasion. Also sells Cambridge Imprint printed papers and notebooks. Paperchase 77a George Street. Good gift wrap, stationery, and a selection of specialist papers and art supplies at the back. Dicks 3 North West Circus Place. Mainly exquisitely curated clothes, but also stockist of Esme Winter patterned goods and some exquisite Japanese paper blocks. Look in the cabinet for Kaweco pens. 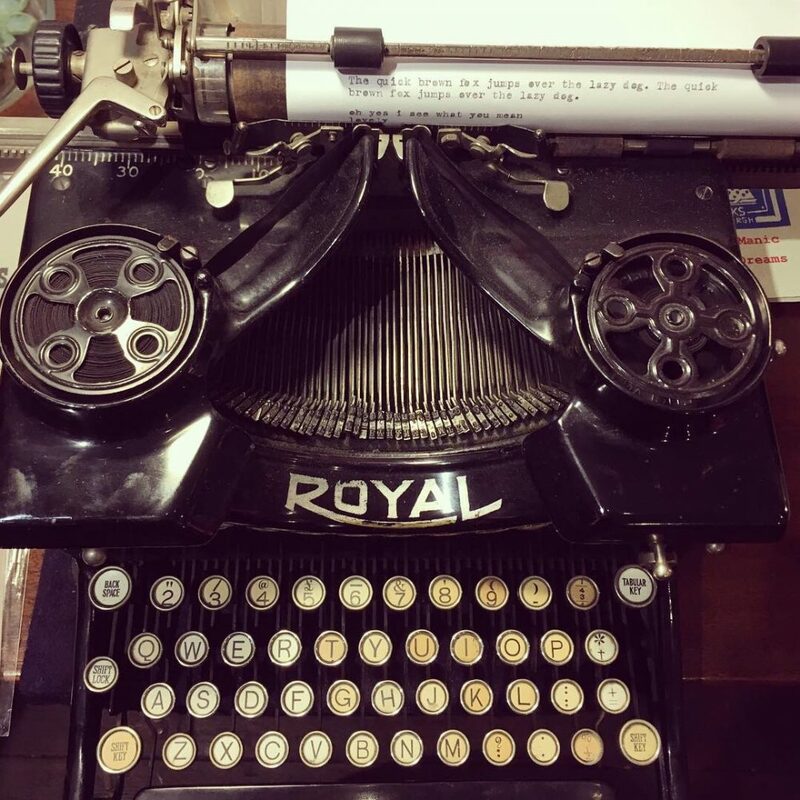 The Write Stuff 43 Raeburn Place. Find the gorgeous J. Herbin ink (as used in Bound:15 Beautiful Bookbinding Projects) under the counter. Concrete Wardrobe 50A Broughton Street. 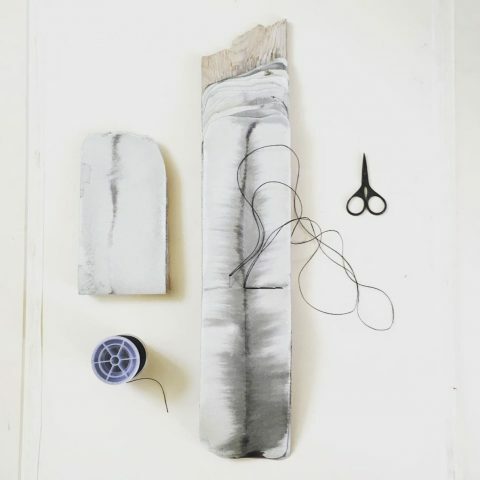 Championing Scottish makers of textiles, ceramics, print and jewellery. Curiouser & Curiouser 93 Broughton Street & 106 Bruntsfield Place. 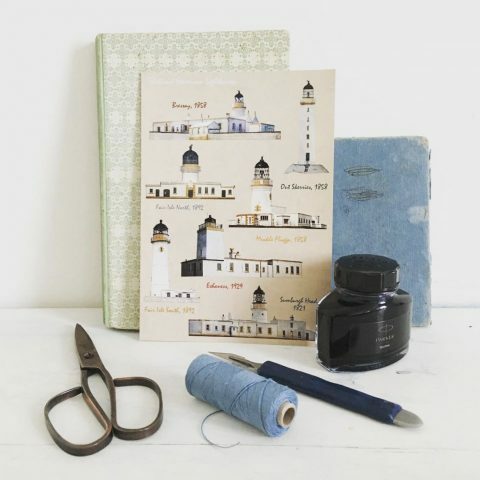 For cards, wrap, washi tape and the brilliant 50 Shades of Scotland print, as well as Edinburgh-inspired illustrations. 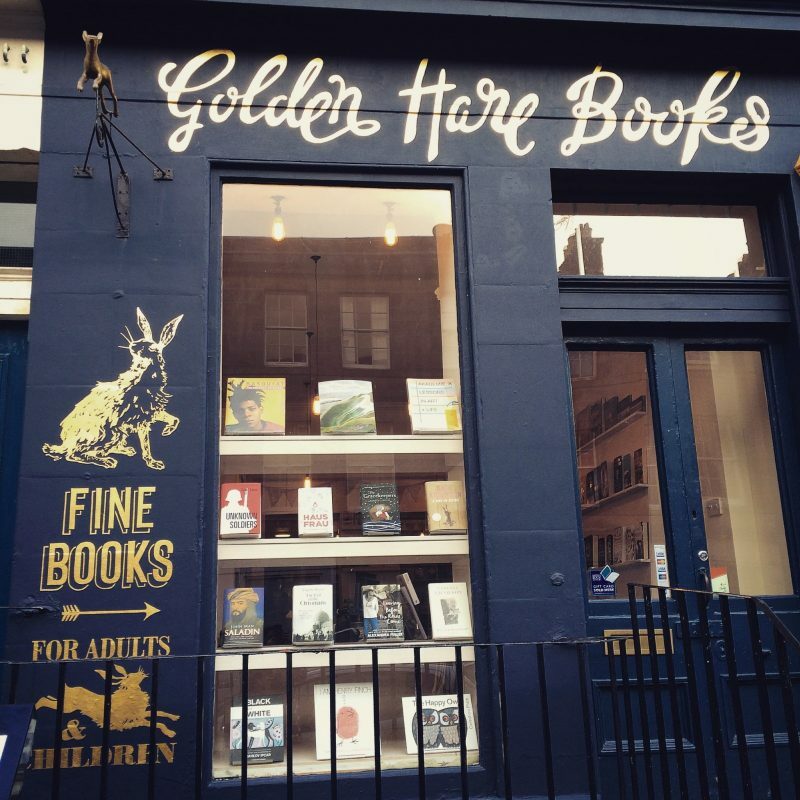 Golden Hare Bookshop St Stephen’s Street. My very favourite local independent, displaying a selection of beautiful books. They offer a Subscription Box if you’re too far away to visit regularly. On the same street, stop for a cuppa at Lovecrumbs (basement of no.22) or a coffee at Sprio, and indulge your senses at The Method. And look up to find this open book on the roof line. 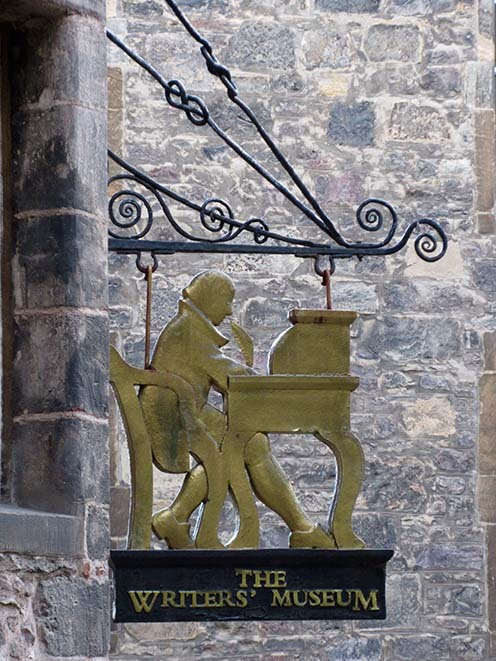 West Port, just off The Grassmarket, has a number of second hand bookshops including Edinburgh Books and Armchair Books (…and strip bars….it’s also known as The Pubic Triangle…) Happy browsing. McNaughtons and Typewronger 3A & 4A Haddington Place EH7 4AE. 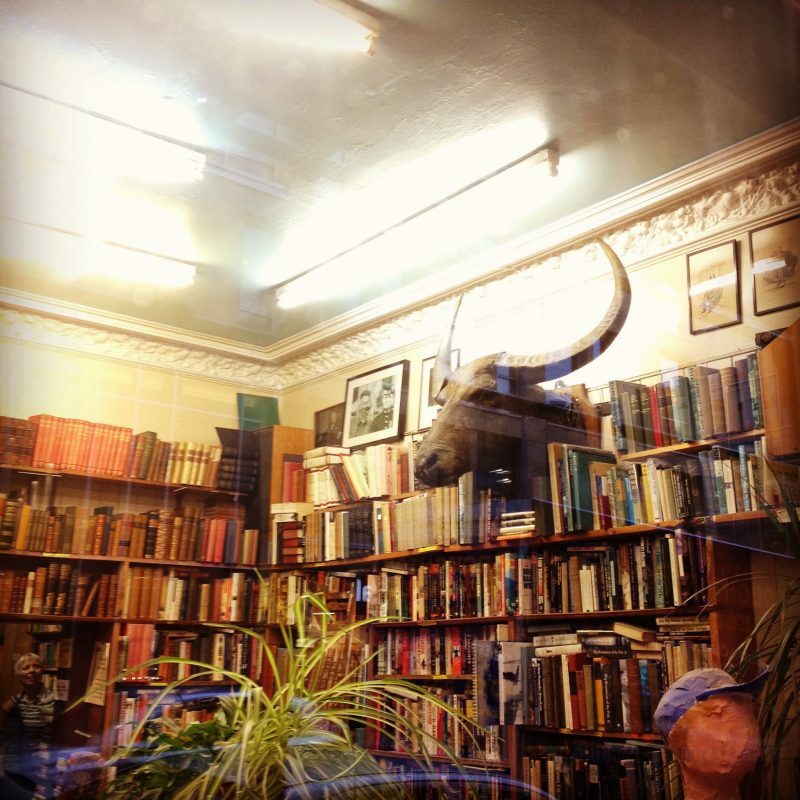 A winning combination of Scotland’s oldest antiquarian and second hand bookshop next to a typewriter emporium (sales, servicing and repairs) also trading in new books and top chat. Fruitmarket Market Street. Contemporary art with fabulous bookshop/magazine range and sometimes artist’s books. Hosts annual Bookmarket. National Gallery of Modern Art Great collection of contemporary art in two handsome neo-classical buildings. Includes an extensive collection of Dada and Surrealist art. Jupiter Artland Out-of-town sculptural wonderland. Make a day of it. The Writers Museum Lady Stairs Close. 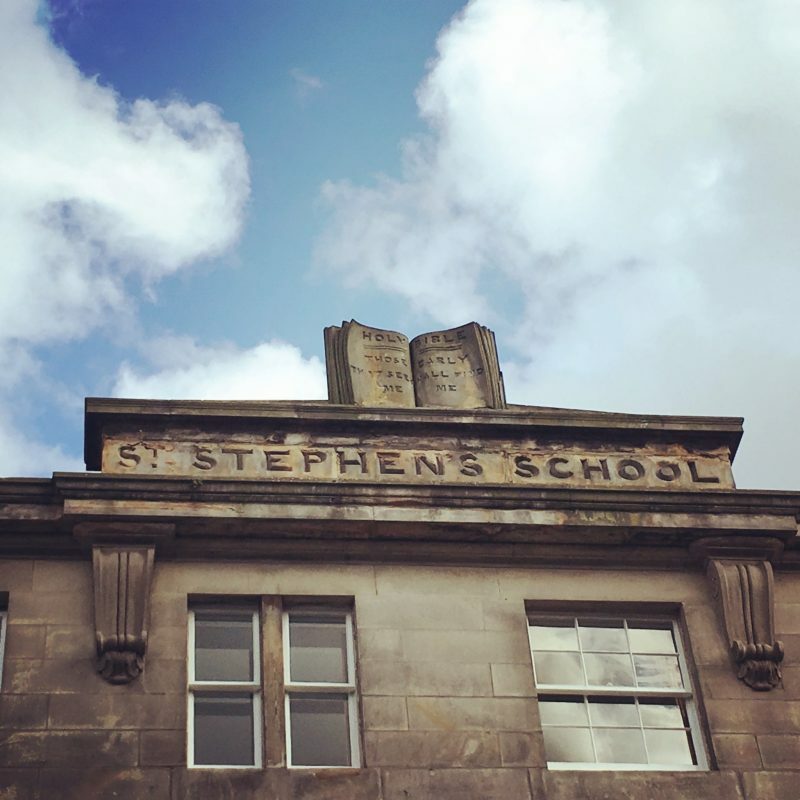 Devoted to the lives of three giants of Scottish Literature – Robert Burns, Sir Walter Scott and Robert Louis Stevenson. A fabulous free resource. The Ingleby Gallery 33 Barony Street. Private gallery showing established and emerging artists in a contemplative calm space. The Open Eye Gallery 34 Abercromby Place. Contemporary painting, print making and applied art. Edinburgh EH8 8DT. Custom built premises for poetry. Whose collection has ‘a national core but an international outlook’. Central Library 7-9 George IVth Bridge. As on all Carnegie’s lending libraries ‘Let There Be Light’ is inscribed over the entrance. A traditional lending library with a multitude of resources. 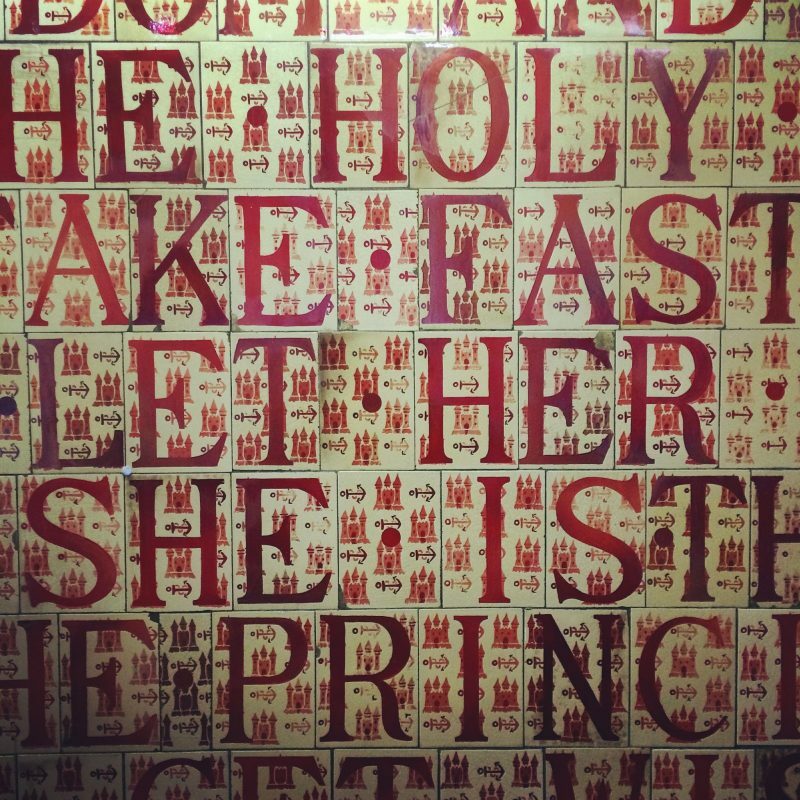 Find this wall of tiles in one of the stairwells. National Library of Scotland George IVth Bridge. The legal deposit library of Scotland. Brilliant free exhibitions and a small but good shop selling bookish merchandise. 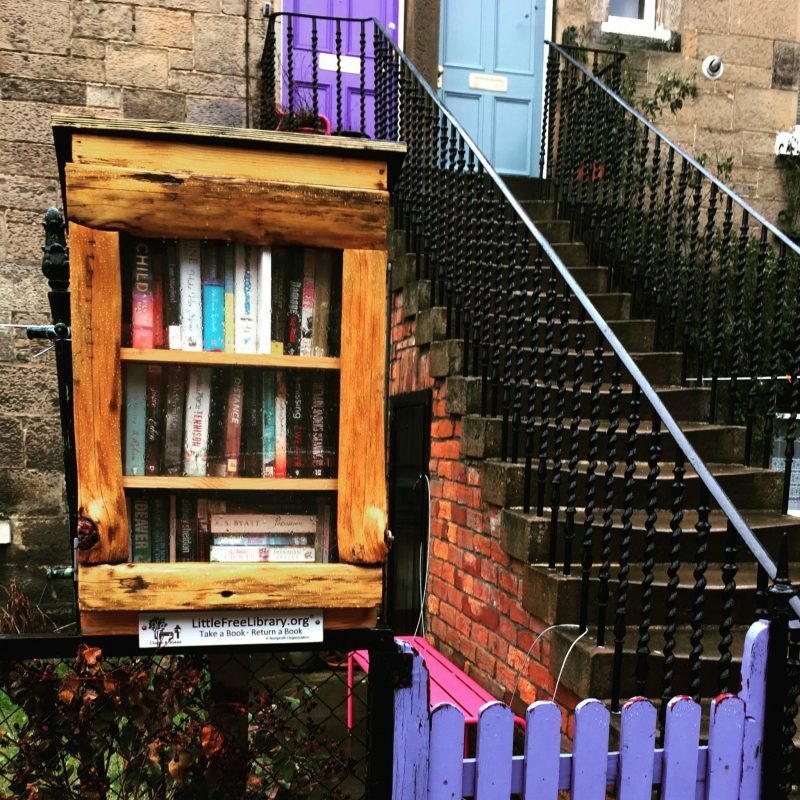 Little Free Library Seek out and borrow books from mini-libraries on Scotland Street, Teviotdale Place, the Botanical Gardens and Dalry Place. Lovecrumbs on West Port and St Stephen’s Street. A delectable choice. Smith & Gertrude Hamilton Place. Cheese and wine = Win Win. Educated Flea 32B Broughton Street. Dinky sister to Apiary and Three Birds, serving up excellent tastes and value. Apiary 33 Newington Road. From brunch, lunch, to dinner, find all you need here. Three Birds 3 – 5 Viewforth. Fantastic food in a great neighbourhood. The Outsider 15 – 16 George IVth Bridge. Good for lunch before or after library visiting. L’Esgargot Bleu 56 Broughton Street. A charming taste of France. Timberyard 10 Lady Lawson Street. Unusual, stylish – an experience for the senses. Gardener’s Cottage 1 Royal Terrace Gardens. 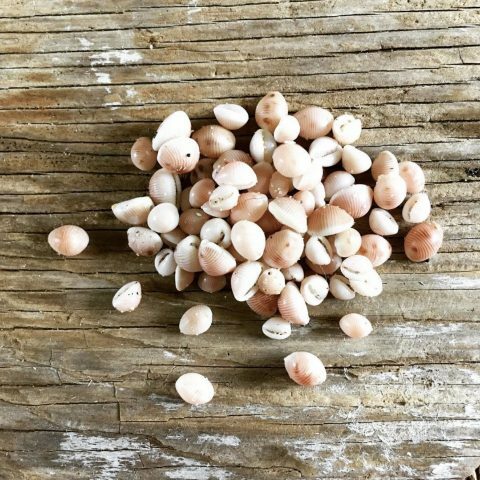 Slow, seasonal, sustainable communal dining. Lovely. Edward and Irwyn 416 Morningside Road. Passionate artisan chocolatiers with flavours such as juniper, Scots pine & smoked salt or beetroot, blood orange & vanilla. Only open Thursdays and Saturdays. Follow them on Instagram and make your mouth water. 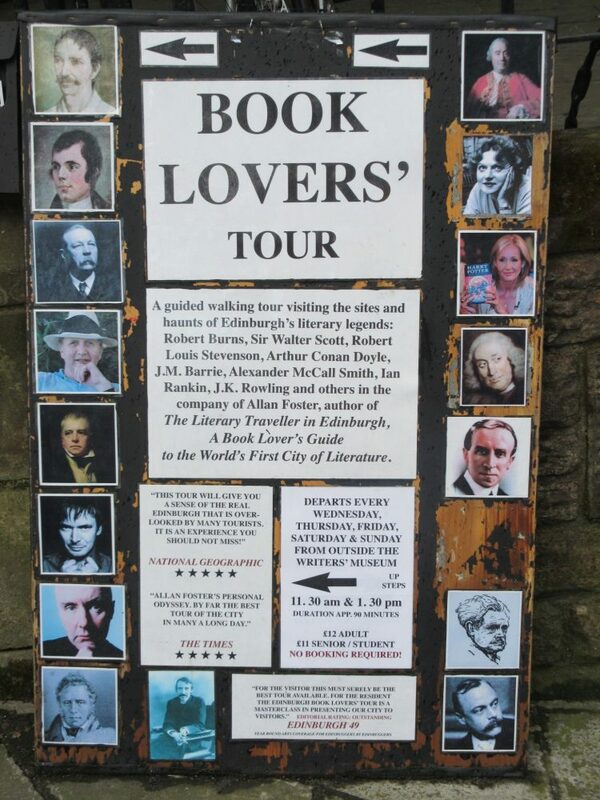 The Edinburgh Book Lovers Tour a walking tour visiting the sites and haunts of Edinburgh’s literary legends. The Edinburgh Literary Pub Tour a literary trail performed by actors. Rebus Tours based on the bestselling Inspector Rebus books by Ian Rankin. 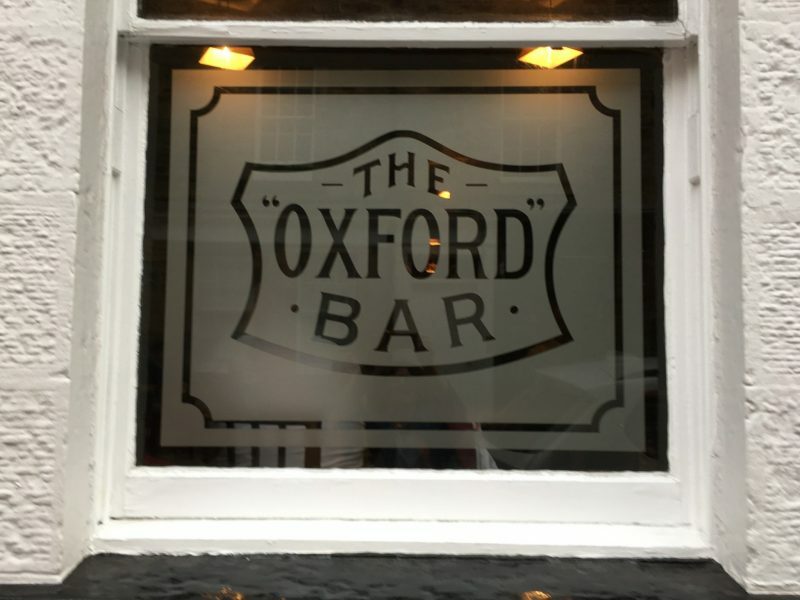 If you don’t end up in The Oxford Bar, find your way back there. It’s perfect. Trainspotting Tour with Leith Walks. Explore the edgier parts of Edinburgh depicted in Irvine Welsh’s book and film. Harry Potter Tour for fans of J.K. Rowling’s famous wizard. Secret Edinburgh Hannah Robinson. 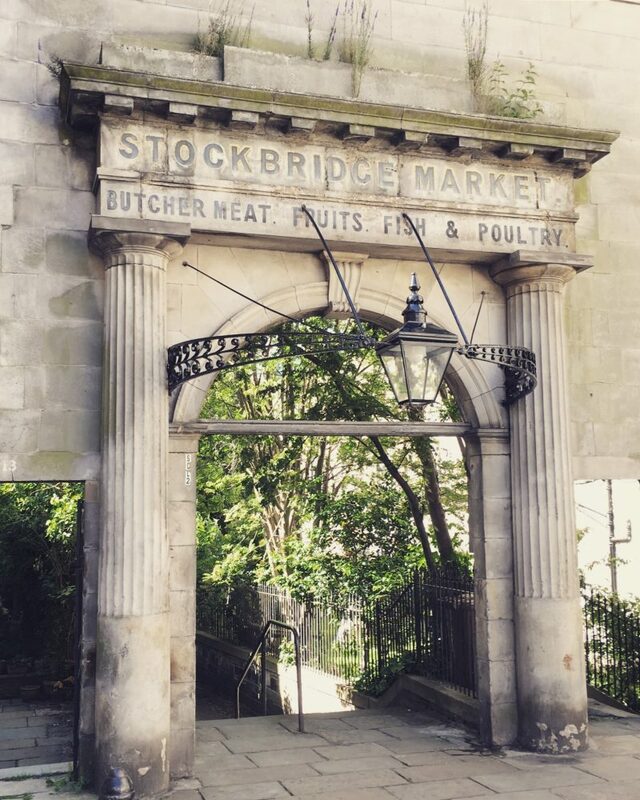 Discover the lesser-noticed, hidden details of the city. 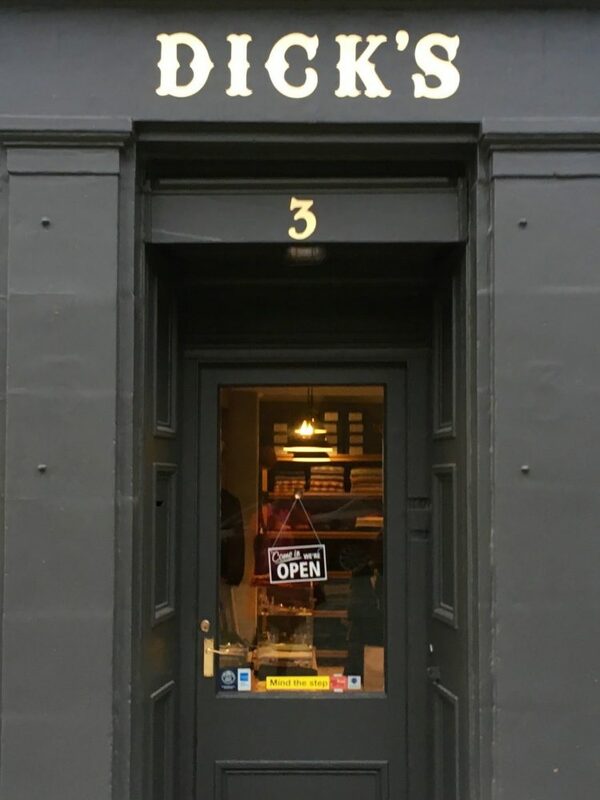 The Local’s Guide to Edinburgh, by Owen O’Leary and Claudia Monteiro. Like having a friend to go round with. Get hold of a second-hand copy. 44 Scotland Street series, by Alexander McCall Smith. Set in a fictional house on a very real street in Edinburgh’s New Town, this series introduces a cast of characters who may be fictitious but are entertainingly familiar. Please check details before venturing out. Happy wandering, discovering and documenting. 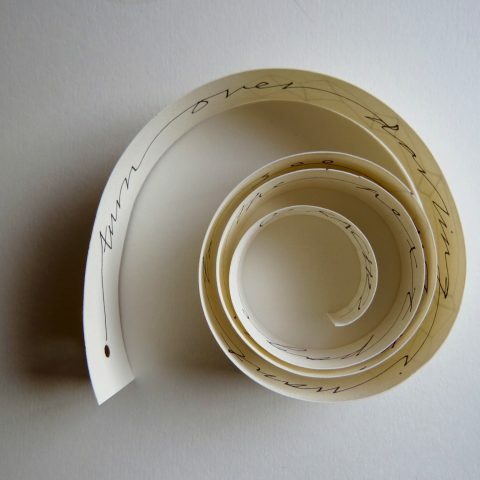 Rachel Hazell has studied, created, taught and written in Edinburgh since 1990. She read English Literature at Edinburgh University, made book sculptures during a Masters Degree at Edinburgh College of Art, and set up a little library on her garden fence. She goes on book adventures round the world with The Travelling Bookbinder and loves coming home. Thank you, Rachel! This is exactly what my friends and I had hoped to find—-a list with paper places, book shops and suggestions for eating. Bless your heart! A lovely selection. Recently I bought wonderful two-sided wrapping paper with a geometrical pattern from Bonkers on Hanover Street which I am addicted to using for books. Thank you Elizabeth! Good to hear a recommendation for Bonkers – will check them out. Happy binding! What a wonder you are! Thanks so much for putting this together. I look forward to exploring the places I have not yet enjoyed, and as many eateries as possible. It’s a pleasure Lindsay! Happy exploring (and eating)! Wow, Edinburgh, wasn’t in my bucket list for travel until today! With a list of suggestions as delicious as this ‘papery’ list, how could one go wrong! Just at the end of my few wonderful days in Edinburgh, and I now wish I had longer to search out the places I have not yet found from your list! Just bought a copy of ‘Gifted’ to treasure once am back on the Isles of Scilly. A golden list from a gifted and golden woman. How lovely! I miss Edinburgh so much! Rachel, such a useful and inspiring list. Thanks so much.